How many times this thought swirl in your mind to just break up with him? You deserve a better person than him, for too many valid reasons, in your life. Think about a happy relationship, the one in which both partners are mutually contributing, not just love but also support to each other, and wishing for the good as a couple and as individuals. Despite, the things that you have thought about as a happy couple, you are living in a constant struggle; trying to satisfy your partner’s demands from your relationship, you are not in a happy relationship. Perhaps, you are decreasing every chance for yourself with passing time to get a better person, a deserving partner, and the one who can acknowledge your efforts for him. Imperfections exist in every single person alive on earth, but no one can blame the other person for the flaws that are bringing damage to the relationship. You cannot expect one person to dedicate all of their time and effort, without contributing yourself. Such relationship is a struggling one and weak to sustain in the long run. 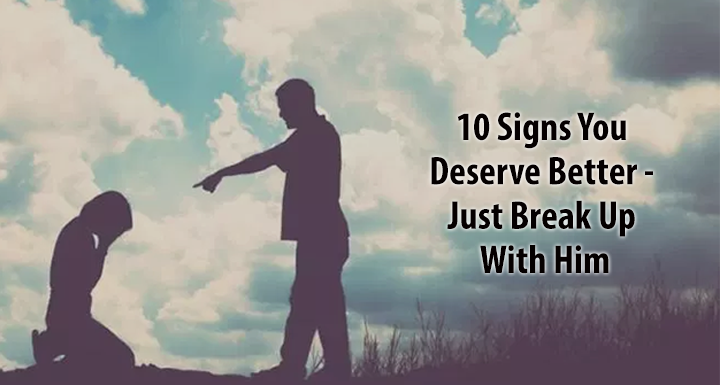 People have a lot of questions about a bad relationship, consider following points the red flags and warning signs to just break up with him because you deserve someone better. 1. He replies to requests on dating apps. What makes you think he is serious with you, when he is still active on dating apps? If you are able to check his computer and find new notifications and requests from other girls then don’t rely on him for another second. 2. He has other priorities in his life than you. You understand a person’s commitment to work, family, and friends but when it becomes a routine that you are constantly playing second-fiddle, he has something important than you in his life, it’s better to walk away. 3. He seldom makes an effort to ever make you feel special. A relationship works two-way. You like him and are doing effort to make him feel special and happy. However, you never feel the same way or he has not been doing any special thing so it looks that he is really interested. 4. He hasn’t thought about a plan for his life. A person still looking for a direction and is not sure what he wants to do with his life doesn’t worth being in a relationship with. 5. He spends more than he earns. His outstanding bills and installment plans are hurdles to gain financial stability. Sooner or later, there will be a problem to manage finances for both of you. If he doesn’t understand this important aspect, as a couple, he will never get matured to handle money matters. 6. He is not committing to anything in your relationship. A guy who is not able to commit a single thing to you and your relationship with him, there is no chance that he thinks himself your boyfriend. 7. He is always late or cancels meetings with you on 11th hour. Your boyfriend doesn’t seem to value your time if he comes late to an arrangement or cancels it on his convenience. He can’t value your time, how do you expect him to value you as a person? 8. He is a suspicious character. You are never allowed to find out details on his life which shows his lack of commitment to you. You are sometimes suspicious on his acts and this could be an indication that he is cheating on you. It’s natural to be possessive about your partner because you want to save them from any potential harm. However, over-possessive nature could be a sign of insecurity of your boyfriend. 10. He has recently appeared addicted. There is no other way to help him than to seek professional help.